How big is baby: Lemon is now the size of a large jicama (um, weird), but he probably weighs about 3 and 3/4 pounds and is over 16 inches long. Anxious about: This and that here and there; my anxiety has slowly been getting better! For Lent instead of giving something up, every time I start to get anxious about this pregnancy I say a prayer for Lemon, and for someone else - a lot of times someone I know, but sometimes not - I figure this is a comfort for me and a good way to get out of my head during this season. Diet/Cravings/Aversions: So far so good on the aversions - sometimes there are things I'll have that give me some acid reflux in my throat, but (knocks wood), nothing that's made me sick as of late! Definitely still on the fruits and veggies kick - usually I've had at least three servings of fruits and vegetables by mid-morning! Movement: Oh my gosh it's simply the best! There was a night this week where Lemon was especially active right as I was falling asleep - he was moving and kicking so hard it woke me up and I instinctively said, "buddy, what are you doing in there?" I later told Ben I think he took a page out of Madonna's book and was vogue-ing because seriously he was all over the place! The belly: Woah belly! Let's do a little comparison shall we? 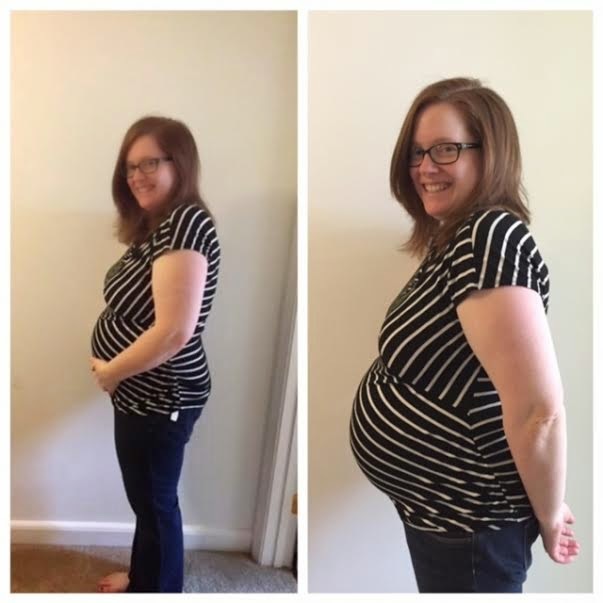 I'm wearing the same outfit in both of these but the left is 22 weeks and the right is 32 weeks! (Also, no idea why the left picture is blurry. Ah, cell phones). Miscellaneous: We've taken a birth class which was pretty useful and helped clear a few things up for us. However, there was a part during the class when we were watching a video (it was someone talking, nothing traumatic), and Ben looked over at me and whispered, "are you okay?" I must have had a deer-in-the-headlights look because I whispered back, "I don't like any of my options. He's just going to have to come out a different way." Ha! Also, I have two more bi-weekly doctors' appointments and then I start going weekly - talk about really being in the home stretch! At my appointment this morning the doctor kept telling me how my weight gain was great, and that I looked fantastic - definitely a great way to start out my week! 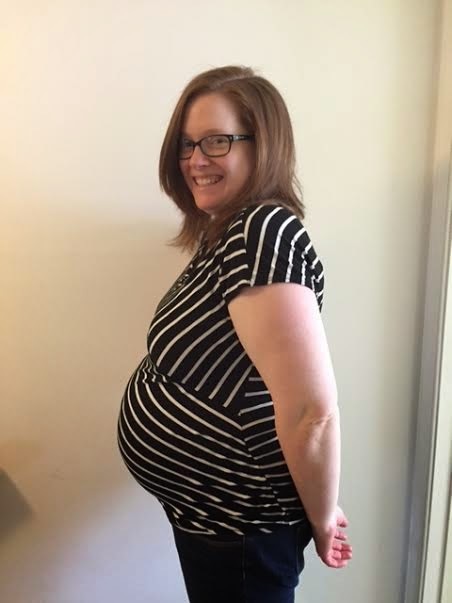 Things that made me laugh/cry: The baby shower that was thrown for me last Sunday was simply wonderful, and yesterday some of my nearest and dearest blogging turned in-real-life friends had a virtual baby shower for me as well! People got on and off a big Google hangout as they could, there was lots of laughter and lots of baby talk! (By that I mean talk about babies, not actual baby talk). It just warms my heart to see how much Lemon is already loved! 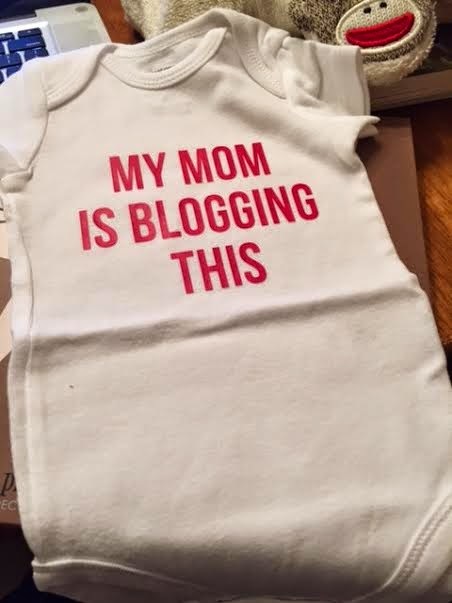 So glad you love the blogging onesie! I can't wait to see a photo of Lemon in it!! It's so crazy to see your 22 and 32 week photos side by side. What a difference 10 weeks makes! Wow, those side by side photos are amazing! It is crazy how much Lemon has grown in 10 weeks! I am so glad we got to celebrate you and Lemon on Sunday! It was so wonderful to see you and everyone that was able to join! Your idea for Lent is such a great one. I gave up sweets but I am not exactly going to experience much growth as a result... your idea is excellent, though! I hope it's been helpful!